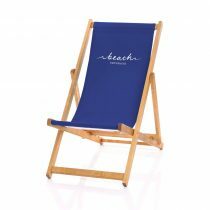 With marketing budgets being reduced for most businesses and advertising rates soaring, we felt it was the perfect time to produce affordable products that can send your message out to the masses, but will also be a long-term investment. 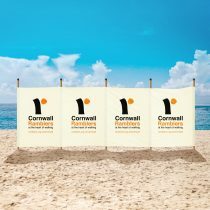 Compared to the prices and results that can be gained from billboard , TV and signage advertising; South Westerly Windbreaks and Deckchairs are the must-have promotional item with the perfect amount of space to boldly present your logo, message, event or campaign. 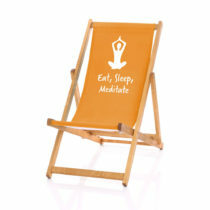 Read our case studies to see how you can stay a step ahead of your competitors. The Marine Conservation SocietyFor over thirty years The Marine Conservation Society (MCS) has been the voice for the sea for all the fascinating creatures that live beneath the waves. 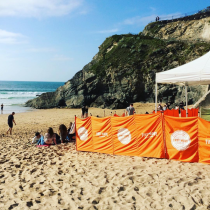 The Little Fish HutThe Little Fish Hut is a mobile catering van attending events throughout Cornwall. 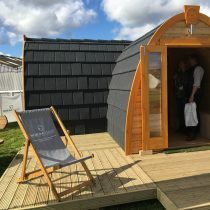 Marsdens Devon CottagesMarsdens Devon Cottages attend many local, county and national shows, so people can meet them and find out about their properties. 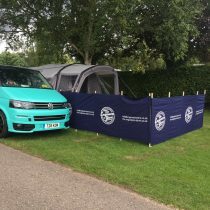 Kustom InteriorsOur windbreaks are already much loved by camper enthusiast, so when Kustom Interiors wanted some windbreaks commissioned we knew they would be a hit. 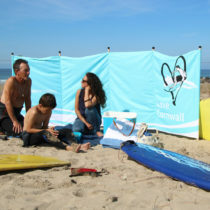 Beach RetreatsWith holiday homes right on the beach in Cornwall deckchairs and windbreaks are an must for guests staying with Beach Retreats! 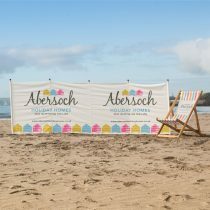 Abersoch Holiday HomesAbersoch Holiday Homes are proud to present high quality self-catering cottages, in an area of outstanding natural beauty. 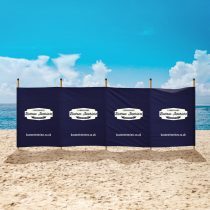 The Engineer StoreThese classic windbreaks from The Engineer Store is proof that it doesn't matter which industry you are in, our windbreaks are the perfect platform. 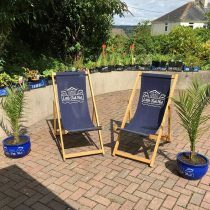 Cornwall RamblersCornwall Ramblers cover a large area with diverse walking, from coastal, to countryside, exploring industrial mining areas and discovering some hidden gems. 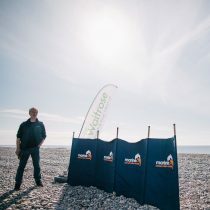 First Wave AdventuresFirst Wave Adventures wanted to find a way to promote the centre as well as section off the beach for their activities. 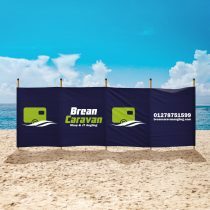 Brean CaravanBrean Caravans commissioned a set of branded windbreaks to rent out to their customers! 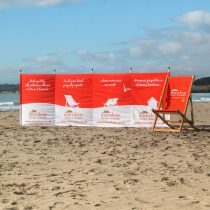 Such a great way to advertise and generate a rental income too! 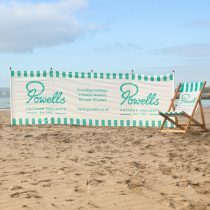 Powells Cottage HolidaysPowells created these classic deckchair and windbreak designs to accompany their guests as they explore the Pembrokeshire coastline and stay in their cottages. 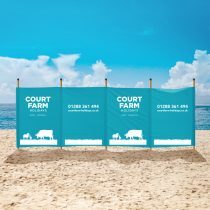 Court Farm HolidaysThese bright and colourful windbreaks for Court Farm Holidays take full advantage of what our UK print service has to offer. 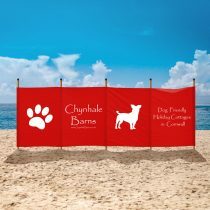 Chynhale BarnsThese striking windbreaks for Chynhale Barns are a perfect example of how to best make use of our creative marketing canvas. 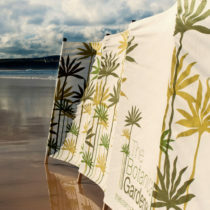 ASPECTS HOLIDAYSBright promotional windbreaks for Aspects Holidays.